"News" from Nixon in China, John Adams, Edward Nelson, baritone, conducted by John DeMain. Nixon had its premiere at the Houston Grand in 1987 and may be Gockley's best new opera. It repeated in 2012 in San Francisco. "Song to the Moon" from Rusalka, Antonin Dvorak, Renée Fleming, soprano, conducted by Jiří Bělohlávek. 2/4 This opera played at the San Francisco Opera starring Renée Fleming in 1995 with Charles Mackerras conducting. Perhaps Renée also sang it in Houston. I remember that I was sitting in the orchestra and looked up to see Renée singing from the top of a tree. "La Tempeste" from Giulio Cesare, GF Handel, Heidi Stober, soprano, conducted by Patrick Summers. 3/4 This opera last played in San Francisco in 2002. "Ain't it a pretty night" from Susannah, Carlisle Floyd, Ana María Martínez, soprano, conducted by John DeMain. This opera last played in San Francisco in 2014 and starred Patricia Racette. "I got plenty o' Nuttin'" from Porgy and Bess, George Gershwin, Eric Owens, bass-baritone, conducted by John DeMain. This opera last played in San Francisco in 2009 with Eric as Porgy. I loved it. "Tanti affetti" from La donna del lago, Gioachino Rossini, Daniela Mack, mezzo -soprano, conducted by Patrick Summers. Act I finale from Die Walküre, Richard Wagner, Karita Mattila, soprano, Simon O’Neill, tenor, conducted by Patrick Summers. Final trio from Der Rosenkavalier, Richard Strauss, Renée Fleming, soprano, Nadine Sierra, soprano, Sasha Cook, mezzo-soprano, conducted by Jiří Bělohlávek. Sasha stood in for an ailing Susan Graham, but nevertheless the trio was wonderful. After the trio Renée Fleming, on the occasion of her 25th anniversary with the San Francisco Opera, received the San Francisco Opera Medal. People who appeared on film on the screen at the center of the stage to express their respect for David Gockley included Joyce DiDonato, Placido Domingo (a fellow opera producer), and Cecilia Bartoli (now also an opera producer) who sang the starring roles in Barber of Seville and La Cenerentola with David early in her career. It was nice to see her. She was busy receiving the Polar Prize in Sweden. "Nessum dorma" from Turandot, Giacomo Puccini, Brian Jagde, tenor, conducted by Nicola Luisotti. He aced this. "Son io spirito" from Mefistofele, Arrigo Boito, René Pape, bass, conducted by Nicola Luisotti. Pape who is in town for Don Carlo is the only person on the program whose career was not significantly influenced by Gockley. Apparently, at the end of the aria there was supposed to be whistling which didn't work. Other people got this while I completely missed it. In this opera the devil whistles. So instead René made funny gestures. "Bill" from Show Boat, Jerome Kern, Patricia Racette, soprano, conducted by John DeMain. Patricia whistled before her song. Someone in the audience gave her a wolf whistle. Lots of laughter. The song was nice. "Sull'aria... che soave zeffiretto" from Le nozze di Figaro, Wolfgang Amadeus Mozart, Renée Fleming, Heidi Stober, sopranos, conducted by Nicola Luisotti. Renée sings this on YouTube with Cecilia Bartoli. "Voi lo sapete" from Cavalleria rusticana, Pietro Mascagni, Dolora Zajick, mezzo -soprano, conducted by Nicola Luisotti. Dolora walks on water. Intermezzo from Two Women, Marco Tutino, conducted by Nicola Luisotti. 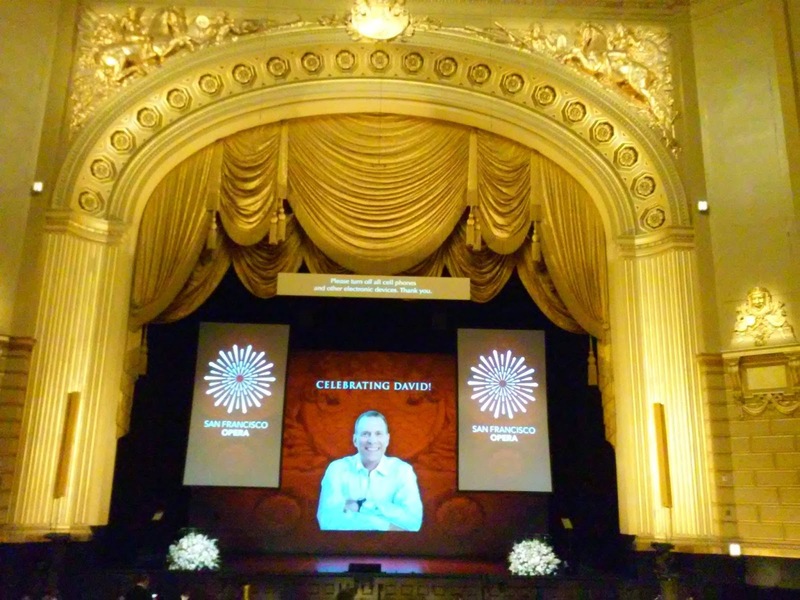 This opera premiered in San Francisco in 2015. "N'est-ce plus ma main?" from Manon, Jules Massenet, Nadine Sierra, soprano, Michael Fabiano, tenor, conducted by Nicola Luisotti. This is the seduction scene from Manon and ended with a lot of smooching. "I can smell the sea air" from A Streetcar Named Desire, André Previn, Renée Fleming, soprano, conducted by Patrick Summers. I'm going to have to reconsider this. This opera was commissioned by the San Francisco Opera and premiered with Renée Fleming in 1998 where the composer conducted. I have a film of it somewhere. "Ah! Je vais mourir... Adieu, fiere cite" from Les Troyens, Sasha Cook, mezzo-soprano, conducted by Patrick Summers. Sasha did a very respectable job with this in spite of the last minute fill in. This opera was one of the highlights of David Gockley's tenure here. Talking, followed by the ending. "Make our garden grow" from Candide, Leonard Bernstein, Brian Jagde, Catherine Cook, Adler fellows, conducted by John DeMain. This was an extraordinary gala uniquely tailored for the man being honored. At the end of the program it was announced that David Gockley would continue his affiliation with the title General Director Emeritus. As far as I know, there is no archive for the Houston Grand Opera. Perhaps they could consider creating one. See also here and here. I went overboard with this, but I was interested in Gockley's relationship to the repertoire.